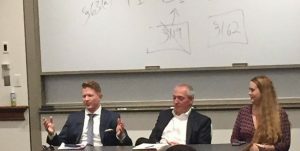 On September 13, 2018, Kristen Sparks joined John Simon of The Simon Law Firm and Mike Dalton of O’Leary, Shelton, Corrigan, Peterson, Dalton & Quillin on the “How to Make the Most of your Summer” panel at Washington University School of Law. The panel offered law students advice on networking, maintaining contacts and getting involved in the St. Louis Legal Community. All three panelists are active members of the Bar Association of Metropolitan St. Louis (“BAMSL”) and encouraged the law students to get involved with BAMSL and other professional organizations.